the City of Cumberland. Between 75 and 100 years ago, an addition which is larger than the original log dwelling was added to the west end. The part of the dwelling which was built and used by the Fraziers consists of the log portion of the structure on the East side. A State Roads Historical marker stands in front of the house on which is summarized its history. It is to be recalled that after the defeat of General Braddock in July, 175 5, that the Indians and the French held sway over most of the territory in and around Fort Cumberland. Many settlements were destroyed and a number of settlers and their families wiped out by the marauding Indians. It was in the Fall of 1755 that Jane Frazier, accompanied by a man servant named Bradley, was riding on a knoll just west of her home. A party of Indians surprised them, killed Bradley and took Jane captive. The Indians took her as far west as the Miami River in what is now the State of Ohio, and there kept her a prisoner for thirteen months. Here she was compelled to live as one of them. Finally, during the early winter of 1756, she managed to make her escape. After incredible hardships, she made her way east and finally reached her home near Cumberland. After her capture it was presumed that she had been killed and her husband, John Frazier, remarried. Legend has it that when she returned to her home, the second wife realized that Jane was John Frazier's true wife and left Jane with her husband, John. It is also interesting to recall that John Frazier knew George Washington. When he first came into the wilderness in 1753, he located at the Indian Village of Venango in Pennsylvania and built a gun factory and dwelling. When the French captured the town, the French Officer used Frazier's house as his headquarters. When Washington made his first trip into the Ohio territory in 1753, he spent several days with Frazier and later made him a Lieutenant. It was after this time that Frazier came as far east as Winchester, Virginia. After their marriage they moved to Evitt's Creek near Fort Cumberland where Jane was subsequently captured. In the second expedition of the British to capture Fort Duquesne in 1758, Lieutenant Frazier joined Washington at Fort Cumberland. Due to Lieutenant Frazier's intimate knowledge of the topography in and around Fort Duquesne, he served as a guide to the English and American Army when it made the march on the French Fort which resulted in its capture. An interesting novel dealing with the life of Jane Frazier has been written by one of her descendants. 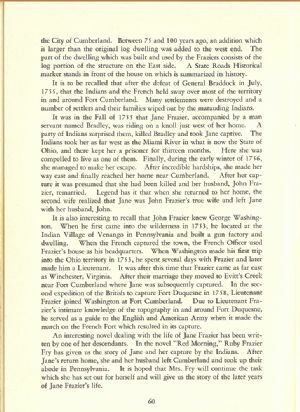 In the novel "Red Morning," Ruby Frazier Fry has given us the story of Jane and her capture by the Indians. After Jane's return home, she and her husband left Cumberland and took up their abode in Pennsylvania. It is hoped that Mrs. Fry will continue the task which she has set out for herself and will give us the story of the later years of Jane Frazier's life.